Best Buy To Pull CDs From Its Stores, According To Report : The Two-Way The International Federation of the Phonographic Industry estimates that 112 million people worldwide now pay for access to streaming services. 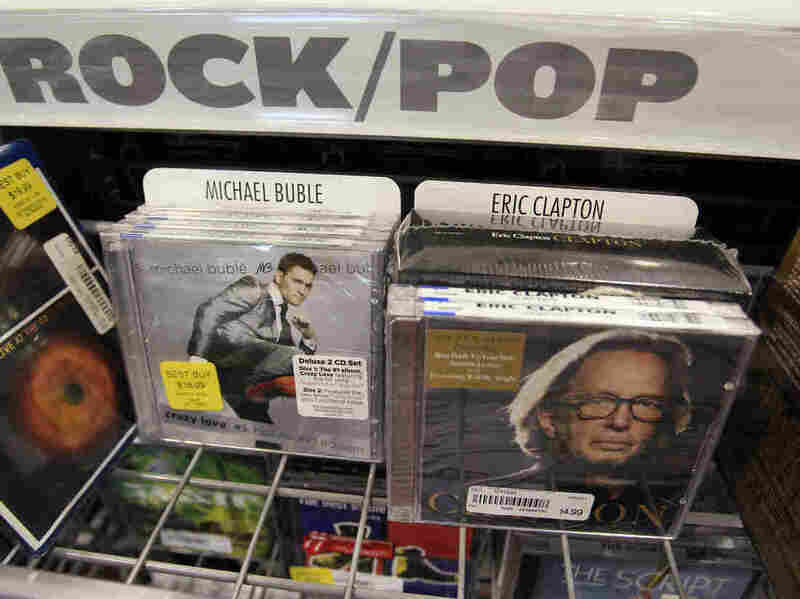 In 2011, CDs by Eric Clapton and Michael Buble were on display at Best Buy in Mountain View, Calif. According to Billboard, customers soon won't be able to find CDs at Best Buy. Best Buy has told music suppliers that it will pull all CDs from its stores this summer, according to a report from Billboard. This move should come as no big surprise: Between unlimited streaming services like Apple Music and Spotify, and the ongoing vinyl revival, CDs just don't have the sway that they used to. "After hitting record highs in the CD era, the global market for recorded music began shrinking dramatically in 2000. It lost 40 percent of its total value over the following 14 years, which spanned the birth of Napster and the file-sharing era, the decline of the CD and the rise and fall of the MP3. ... Then came streaming — which the record industry warily, then wholeheartedly, embraced." In 2015, music streaming resulted in the first increase in the music industry's global revenues since 1999, by $500 million. In 2016, streaming services became the primary way Americans listened to music, according to data from the Nielsen marketing research company. And in 2017, as NPR's Sonari Glinton reported, the Ford Motor Co. rolled out its first car in 25 years without a CD player. "Streaming is the fastest-growing source of music and video content and particularly with younger consumers, who we've found time and time again prefer streaming and subscription services over traditional forms like CDs," Ford marketing manager Michael O'Brien told Glinton. O'Brien isn't wrong. The International Federation of the Phonographic Industry estimates that 112 million people worldwide now pay for access to streaming services and that streaming services contributed toward a 20.5 percent decline in downloads and a 7.6 percent decline in physical revenue in 2017. Best Buy generates nearly $40 billion annually and has more than 1,500 stores throughout North America. Last year, the company eliminated nearly 400 jobs to "meet the significant and evolving tech support needs of our customers," as it said in a letter to the state of Minnesota, according to Fortune. The company told NPR that it has no comment on the Billboard report. A previous version of this story misspelled the name of the the Nielsen marketing research company as Neilson.